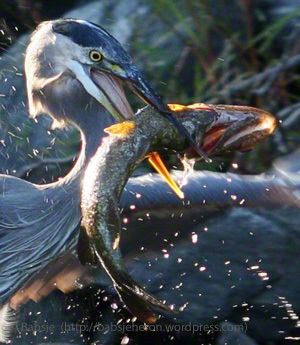 Great blue heron diving beneath the surface – babsjeheron. It was the golden hour, that last hour of daylight when the sun’s rays bathed the cove in gold. The backlit gold-orange spray of water droplets danced before my eyes as the Great Blue Heron plunged her head beneath the surface in pursuit of a prize catch. It was so close to twilight that the Heron’s body was nearly camouflaged against the slate-grey rocks. A few moments later, the Heron and I were both rewarded. She with this huge fish and me with these photos. This is the kayak used for my photography. Thanks to Amy for her Lens Artists Weekly Photo Challenge 19: Magical Light. I find golden hour light to be sheer magic. Thanks to Cee for her CFFC: Things People Drive Ride Pilot or Captain. The kayak shown here has been my vehicle-of-choice for many years. Thanks to Debbie for this week’s Travel with Intent Challenge – One Word Sunday: Purple. Yes, the kayak is a shade of purple. During September and October, 2018, the Great Blue Herons were featured on the walls of the Natick Town Hall, located at 13 East Central Street in Natick, MA. From May 1 through July 11, 2018, my Great Blue Heron photographs once again graced the walls of the lobby and theater in a free one-woman show at the Summer Street Gallery, of The Center for Arts in Natick. If you’re in the Boston or Metro West area, please stop by to see the current gallery show at TCAN. The gallery is open whenever the box office is open, so please check hours here. Posted on November 11, 2018, in ardea herodias, Art, Cee's Fun Foto Challenge, Fine art, golden hour, Great Blue Heron, Kayaking, Photography, Weekly Photo Challenge, Wildlife Photography and tagged # Lens-Artists, #OneWordSunday, #ows, heron, postaday. Bookmark the permalink. 16 Comments. How amazing!! Thank you so much! Mary Oliver is a national treasure.